If you have been following these posts and our slowly unfolding spring in southern Maine, you know that I have been watching these Crocus since they first popped up green leaves on Easter Sunday. In other years they have gone from leaf to flower in days. It took weeks this year. But they are here. 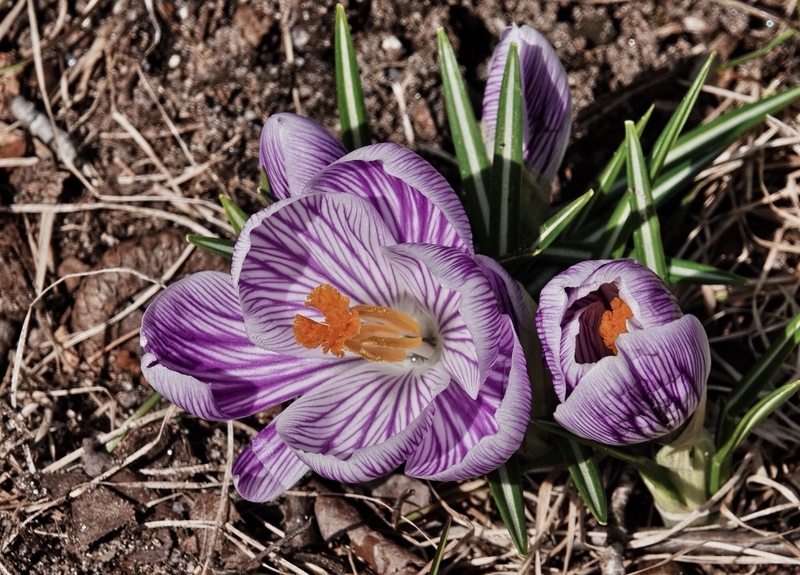 When I went out for my bike ride yesterday at 11, it was above 50 degrees…and the Crocus were open! About time! We will get to enjoy them for a few days at least. I noticed that the daffodils along the front of house look about readymade to bloom, so maybe we have flowers for a while now. Though they say it will be below freezing with sleet on Sunday. 🙁 Rejoice in Crocus while ye may! Sony RX10iv at 600mm from 4 feet. Program mode. Program shift for greater depth of field. f10 at 1/320th @ ISO 100. Processed in Polarr.